Senate File 451 transferred Iowa 249 in its entirety, in the City of Winfield, to city jurisdiction on July 1, 2003. Beginning on Locust Street at the south right-of-way line of Pine Street; thence north on Locust Street to Ash Street. 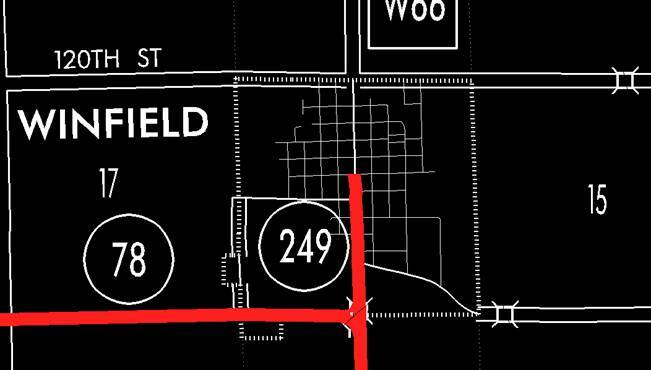 NOW THEREFORE: BE it resolved that the Iowa State Highway Commission approve the revision of Iowa 249 in Winfield, Henry County, Iowa. NOTE: To become effective upon adoption of this resolution, as per agreement dated June 23, 1971. Beginning on Locust Street at the south corporation line; thence north on Locust Street to the south right-of-way line of Pine Street. Beginning on an unnamed street at the south corporation line; thence northeasterly on said unnamed street to Locust Street. Beginning at a point (junction Iowa 76) approximately 600 feet south of the N ¼ Corner Section 21‑T73N‑R5W; thence north following substan­tially the center section line of said Section 21 to the south corporation line of Winfield, connecting with Locust Street. Beginning on Locust Street at the south corporation line; thence north on Locust Street to the south right‑of‑way line of Pine Street. Due to a review of our Primary Road System Records Iowa 249 in Henry County should be deleted and the new description added should be officially included into the Primary System. Iowa 249 begins at Iowa 78 just south of Winfield; and travels northerly to a point in Winfield. Beginning at a point (junction Iowa 78) approximately 600 feet south of the N ¼ Corner Section 21‑T75N‑R5W; thence northerly following substantially the center section line of said Section 21 to the south corporation line of the City of Winfield, connecting with an unnamed street. Beginning on the south corporation line connecting with an unnamed street; thence northerly to the south line of Pine Street. NOW, THEREFORE: Be it resolved that the Iowa Department of Transportation approve the location of Iowa 249 in Henry County, Iowa.